MACOM’s New SPDT Non-Reflective RF Switch Affirms Technology Superiority for Broadband Performance and High-Speed Switching | MACOM Technology Solutions Holdings, Inc.
LOWELL, Mass.--(BUSINESS WIRE)--Sep. 25, 2018-- MACOM Technology Solutions Inc. (“MACOM”), a leading supplier of semiconductor solutions, has again extended its unrivaled RF switch technology leadership with the announcement of its new MASW-011102 SPDT non-reflective switch. Building on the established performance hallmarks of MACOM’s GaAs-based SPDT MASW Series switches, the new MASW-011102 is optimized for use in applications spanning test and measurement, EW and broadband communication systems. 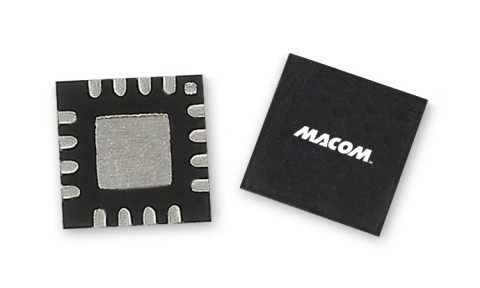 MACOM’s new MASW-011102 low power SPDT non-reflective switch supports broadband operation from DC to 30 GHz, with low insertion loss of 1.8 dB and high isolation of 40 dB at 30 GHz. It utilizes MACOM’s patented low gate-lag GaAs process to deliver uncompromising performance and fast switching speed up to 40 ns. The MASW-011102 is offered in a lead-free, 3 mm, 14-Lead PQFN plastic package for ease of manufacturing, and is fabricated using a robust process containing full surface passivation aimed at ensuring the highest performance and reliability. MACOM’s MASW-011102 SPDT non-reflective switches are available to customers today. For assistance identifying MACOM products optimized to substitute or replace offerings from other vendors, visit MACOM’s Cross Reference tool.